Fish Hawk Ranch - Fightingtown Creek, Great Fishing, Secluded! A True Mountain Experience! Fish Hawk Ranch is a very private cabin on two acres that sits directly on Big Fightingtown Creek, just outside of Blue Ridge, GA. This gorgeous property is designed with family vacationing in mind. The kitchen overlooks the great room so you’re always a part of the conversation and fun. There is an additional living room on the lower level with game system, so your group has plenty of room to spread out. The master bedroom has a double sided fireplace and private screened porch for quiet reflection. And, it all overlooks the creekside campfire for creating those memories that last a lifetime. This beautiful cabin contains a mixture of interior design, combining the rustic luxury of a great North Georgia Cabin experience, along with very tasteful colors, bringing home the country cottage feel as well. FishHawk is secluded yet close to everything! Although, you are hanging your hat where no one else can find you, the charming town of Blue Ridge, GA is only about 10 minutes away, boasting excellent small town charm, with great locally owned eateries, and friendly folks all around. Whether it’s harvest time at Mercier Orchards or dining, antiquing, and an old fashioned train ride in the quaint town of Blue Ridge, white water rafting down the Ocoee River, site of the 1996 Olympics, you are sure to enjoy the charm of this special setting. If your looking for adventure, outdoor activities abound: nature hikes to area waterfalls, tubing, white water rafting, horseback riding, or trout fishing right outside your back door. Whatever your preference, at the end of the day your hammock awaits. Visit Fish Hawk Ranch and experience that great Waterfront Blue Ridge Mountain Cabin Rental that awaits you. Fish Hawk Ranch is NOT pet friendly! Fish Hawk Ranch is located in the north and western side of the Blue Ridge, GA area. Travel the beautiful road of HWY. 5, passing the popular Mercier Orchards, to a tucked away property off a small gravel road, with the rushing sounds of Fitghtingtown Creek as your neighbor. The cabin is about 12-15 minutes from the town of Blue Ridge, though not that many miles away. The property is very close to Lake Blue Ridge, the Toccoa River, the Cashes Valley area for horse back riding, the Ocoee River for White Water Rafting, Zip Lining in the Devils Den area, and many other unique outdoor action and adventure locations. The websites was easy to navigate and there were many choices in cabins in the area. We really enjoyed the cabin and the location. We never came in contact with anyone from the property management company, they took care of everything over the phone! The cabin was a very quaint and cozy place to stay, we took 3 teenagers with us and they had their own space downstairs with 2 bedrooms and a full bath! It was perfect, all the amenities and appliances for the most part were brand new, my wife was pretty sure she was the first one to use the crock pot! It is a great cabin with beautiful views and your own private creek that runs behind the cabin. We had a small issue with a smoke detector that chirped all night.....We called the staff and they quickly resolved the issue! Our time in the mountains was a very special family time. The cabin helped us make some beautiful memories and we would highly recommend Fish Hawk Ranch to anyone wanting to visit the North Georgia mountains. The property is beautiful, the water access excellent and a huge bonus was the fact that the property was child friendly. There was baby gates, a high chair and a crib. These were pleasant surprises! A great crew that responds quickly to any request. This is our Second stay at Fish Hawk Ranch and I am looking to plan a third trip soon. Everything you need is provided within the cabin and the Crew at GMCR is very easy to work with. 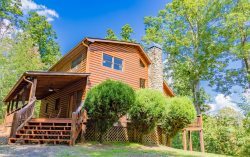 The cabin is located close to the town of Blue Ridge that provides plenty of activities to keep you as busy as you want to be. I highly recommend planing your next trip with GMRC to the Blue Ridge Ga. Area. We did not personally meet any of the team members. We arrived after the office closed, but were able to easily access the check-in information and find the cabin. The directions were VERY helpful. We called the office twice during our visit and the staff were friendly and helpful both times. They answered all of our questions via phone quickly and in a professional manner. The entire experience- from the reservation process to the accommodations- were wonderful. We genuinely enjoyed staying at Fish Hawk Ranch! We could not have asked for a better experience. We loved so much about the property...there isn't just one thing! We LOVED having the fire pit with all the chairs around it. The hot tub was AMAZING as well! And we really liked how there were three bedrooms with large beds, since there were 3 adult couples (no one had to sleep on a bunk bed). We also were appreciative of the two couches in the living room, so that everyone could gather there and no one had to sit on the floor. The layout of the house was perfect for my family. Friendly staff made it very easy to check in and provided all details needed to make the most of our trip. This was an awesome cabin. Great layout and the creek in the back is beautiful. The team from initial contact by e-mail through check-in was very professional, friendly, and seemed interested in me have a good experience. The two gentlemen that picked up the garbage one afternoon were very pleasant and friendly. My family and I all had a great time and everyone was able to find exactly what they wanted to do. Property was very nice. We plan to return in the fall. Peaceful and relaxing stay. Will rent this property again for sure. Have stayed in at least 20 other cabins in ga and this is one of our favorites. Lovely lot and cabin. Beautiful trees surrounding the lot with a large creek right next to campfire pit. Sit and listen to the water as you enjoy the fire. Georgia mountain Cabin Rental company was very friendly and met all of our needs . The cabin we rented, Fish Hawk Ranch, was just beautiful and perfect for our family. Our only regret is not being able to stay longer. Our week was too short,it flew by. We all wanted to stay longer but we will be back! :) This property is awesome and nestled in the perfect little spot on the river. Just beautiful and peaceful! We booked the cabin online at the Georgia Mountain Cabin Rentals website. The description of the cabin was thorough and informative. The cabin actually turned out better than we expected! Check in and check out were a breeze and the staff was friendly and informative. Everybody had a great time (dad, mom, 8 year old son, 13 year old daughter and our black lab). Thank you Georgia Mountain Cabin Rentals. We'll be back next summer (if not sooner). We were very pleased with the property. We had a wonderful time, loved the cabin itself and have no complaints. Great place to stay! We will definitely come back. The cabin was so pretty, warm, and cozy feeling. We had plenty of towels and everything we needed! Company was fantastic to deal with, everything was very simple and intuitive. The cabin was beautifully furnished and everything worked great. We are already thinking about when we can make it back to Blue Ridge! Second time we have used your rental property and both times were excellent. Very friendly staff and very clean homes. Fabulous property management team, 2nd time using them. Always friendly and responsive to calls. This property was able to comfortably house 6 adults and 3 dogs. Lots of indoor and outdoor space to spread out. Hammock, screened and unscreened porches, fire pit, hot tub, fishing right out the back door! Lots to do in town but you may never want to leave this cabin.